Not to be mistaken for.. The first time I saw the sign for Kogi Bulgogi in Eastwood some time last year, when the restaurant itself was still under construction. I went with Rina to meet up some of her high school friends at The Coffee Bean, which was on the ground floor of the next building (across the new Eastwood Plaza). While Rina was sipping on her favorite "Frozen White Chocolate Dream" while swapping stories with her friends, I was looking out the window for a place to eat. Rina says I have an uncanny ability of spotting signs on the road of new menu items from fast food places, so with my eagle eyes, I scanned the area and saw the "Kogi" sign. Instantly it caught my attention. Not because i'm such a Korean food lover (I'm not, In fact apart from Kalbi, Bulgogi and Bibimbap, I don't know any other Korean dishes) but because "Kogi" is the name of a very popular Korean BBQ food truck in LA, that I've been dying to try ever since i've heard of it! In fact, my Ninang Pochay in L.A. got me a shirt! As soon as I saw it, I sprinted to the second floor of the other building, leaving Rina and her baffled friends behind. I was heartbroken (not to mention exhausted) when i got there and realized it was just another Korean Restaurant that ripped off the logo. And though they removed the "flame" from their logo now, I can assure you that their logo on the "Under Construction Tarp" had it, making it look nearly exactly like the Kogi BBQ truck logo (I can't find the pic I took, darn it). Since I couldn't forgive their earlier attempt at deceit, It took me a while before I finally agreed to try the place. It was only when I realized that they removed the flame from the logo that I decided I'll try it. 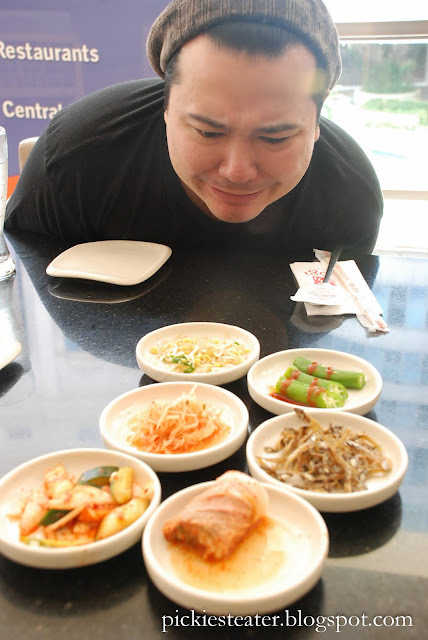 And when we took Schatzi out to Eastwood, it was the best time to go on our first Korean adventure. 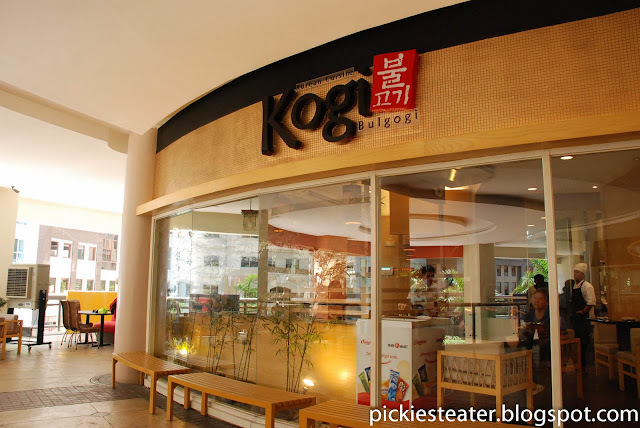 At first glance at the menu, you won't be able to get the feeling that Kogi Bulgogi is a Korean Restaurant. When you go through the menu and see the wide selection of Sushi's and Tempuras, you'd think you had just walked into a schizophrenic Japanese restaurant. Though we ate outside (we were with Schatzi), I saw the interiors had a clean zen design to it. Seriously, does anyone actually eat any of these things? My first comment about Kogi Bulgogi had to be the waitress assigned to us. She seriously needed a couple of bottles of Red Bull to wake her up. Never in my life have I ever seen a more lethargic waitress. She seemed to be coherent and not on any medication, but her responses were so slow. Even when the couple from further out from us called her, she walked to them at a pace that proved she had no urgency at all. I wasn't expecting her to do a quadruple backflip and nail a perfect landing Mary Lou Retton style, but that was ridiculous. Second, I appreciate the appetizers they give you before the meal, but to me, none of them were edible. Given that it was free and my not eating it was a personal preference of a picky eater, that's not what I'm complaining about. Rina, who is nowhere near as picky as me, only ate the caramelized Dilis, and we found a single strand of hair on it! They were quick to apologize and replace it immediately though (They're lucky I don't eat it, so I didn't care). We started with the Gun Mandu (Fried Dumplings) P108, which basically tasted like fried Gyoza. 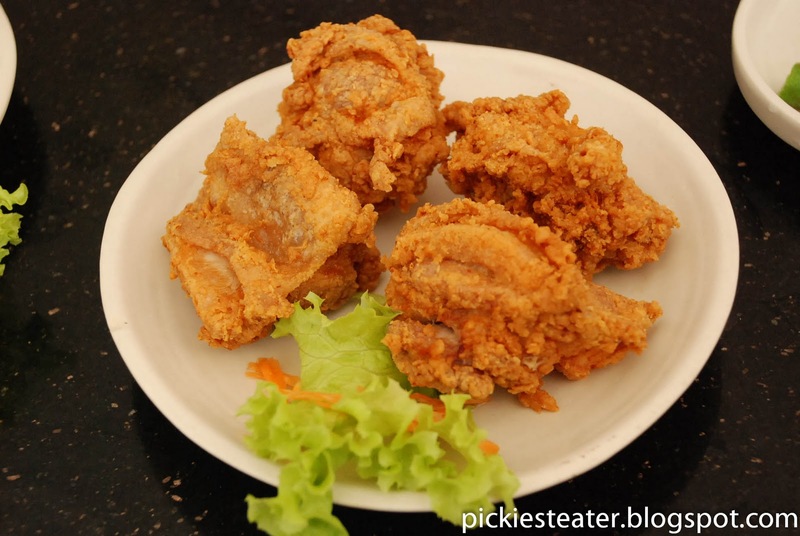 It was fried well enough to give the wrapper a delicious crunch, but keeping the minced meat (with a little veggies) moist inside. Nothing spectacular though. 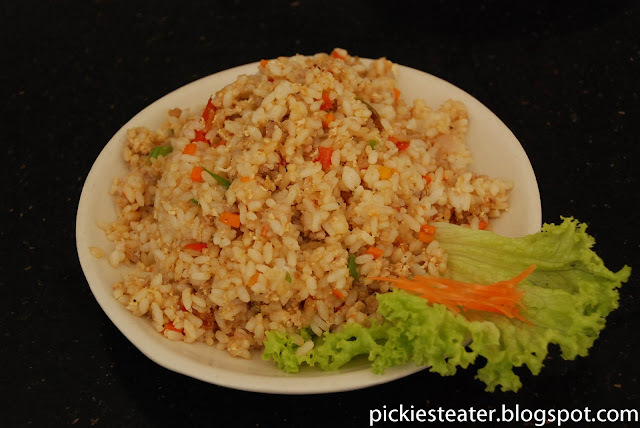 The Fried Rice (P75) was quite tasty. It had the right amount of meat so it won't be too heavy, but added a good kick of flavor that enhanced every bite of the main course. Perhaps my only complaint would be the size of the portion. Splitting it between two people would seriously be pushing it, and could possibly cause a fight. down was totally worth it. 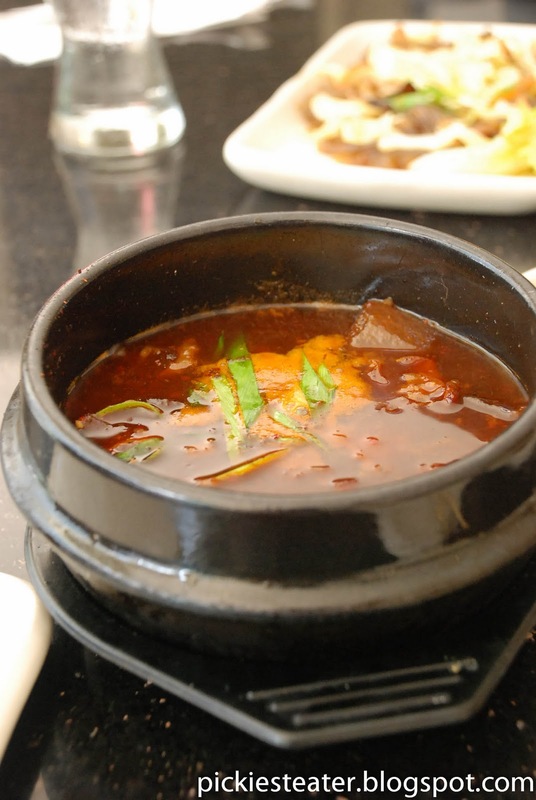 The soup was a blend of gentle spiciness and light sweetness. When mixed with the fried rice, it was amazing. The beef was soft and was easily torn apart by a spoon and fork, and had the flavor of the stew packed into it. Though I knew the spiciness would affect my hyper acidity, I soldiered on, thinking it would ultimately be worth it in the end. I'm still wondering why I ordered this. 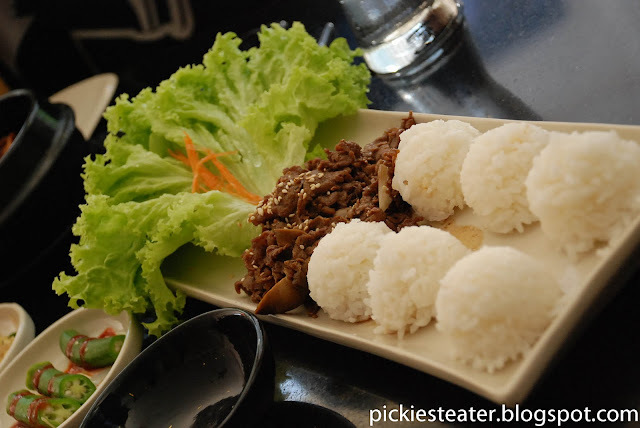 Rina was interested in trying their Bulgogi Ssambap (P228), and I thought it would be an interesting dish to feature in the blog. 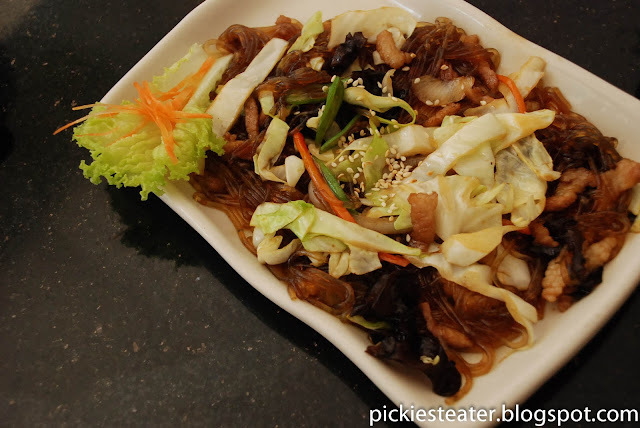 Though It may sound like a Korean version of the Popular Hanson song, its actually just a simple lettuce wrap. 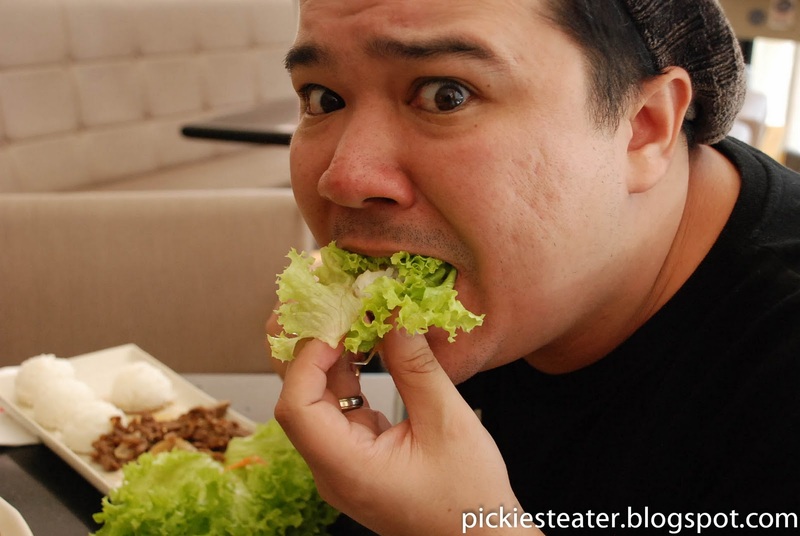 First, you spread the Lettuce out and place the rice on it. Dip the beef in its own juices, and plop it on the rice, and let it soak up the beef "Au Jus". Wrap it up.. and chow down. 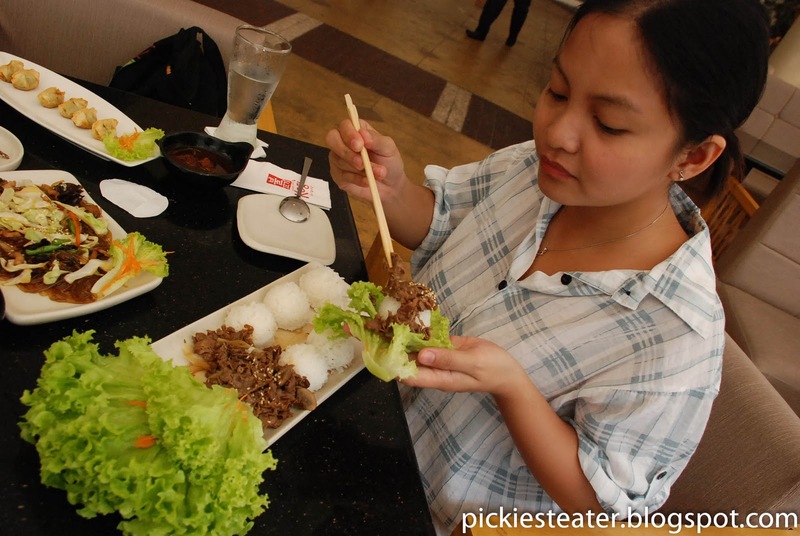 Rina said it was alright, but she ended up eating the Bulgogi and the plain rice.. without the lettuce wrap. I honestly didn't see the point of wrapping it in lettuce, because it did nothing for the flavor. In fact, I think it made it worse. In actuality, the Bulgogi itself wasn't anything to crow about. Which was sad because It's in the name of the restaurant, so I was expecting it to be phenomenal. When you claim a dish like that, you need to back it up. Maybe I should've just tried their simple flagship "Bulgogi" Dish that uses U.S. Prime Beef for a better assessment. Perhaps the only picture in existence of me eating a vegetable. 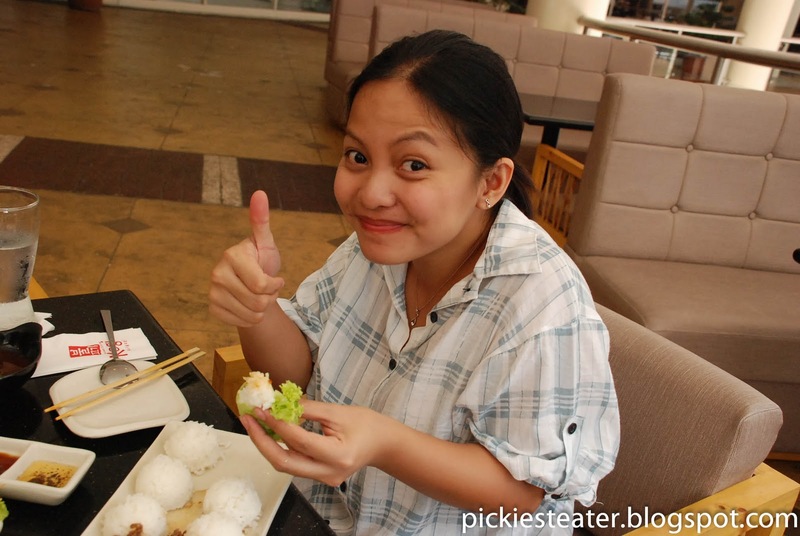 For Blogging purposes, Rina demanded I try the Ssambap as well, so I did. That was probably the most vegetables ever placed in my mouth at one time. I honestly didn't particularly enjoy it. Another weird fact about Kogi: They give you tiny plates. You actually need to ask for a bigger one. 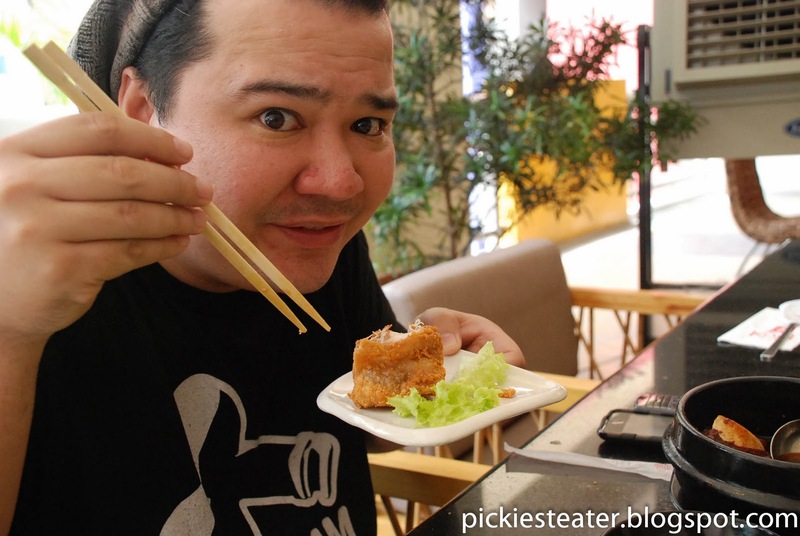 If you're like me and like piling up food in your plate, you're gonna have some trouble. Kogi Bulgoi was a satisfactory dining experience, but sadly falls short in some critical areas: Particularly the Bulgogi. Their Kalbi Jim and Chap Chae nearly made up for all of it, but nevertheless, I would reccomend it to a friend, because of the overall quality of the food, and the very reasonable pricing. 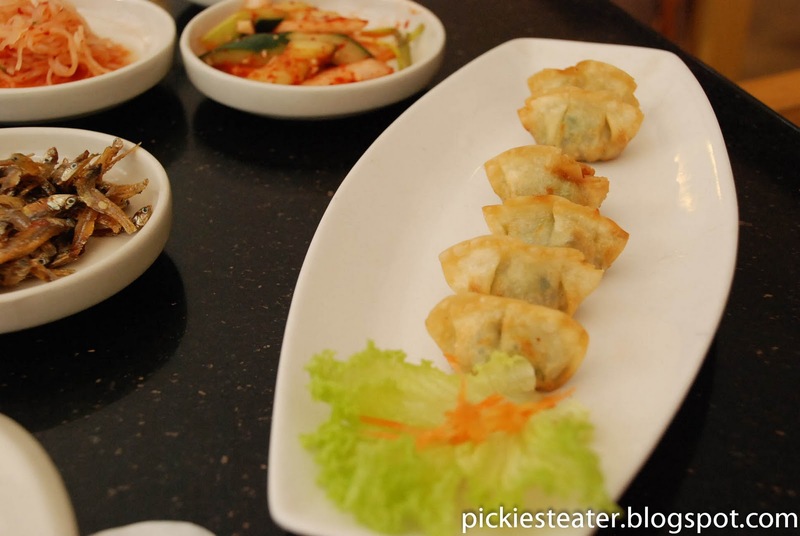 The best Korean restaurant for me is located in BF Homes Paranaque. I hope to do a post about that place some day, because it's pretty fantastic. Thank you for the advice, "Anonymous"!